A petition containing about 200 signatures is on its way from Sackville to Premier Gallant’s office in Fredericton. 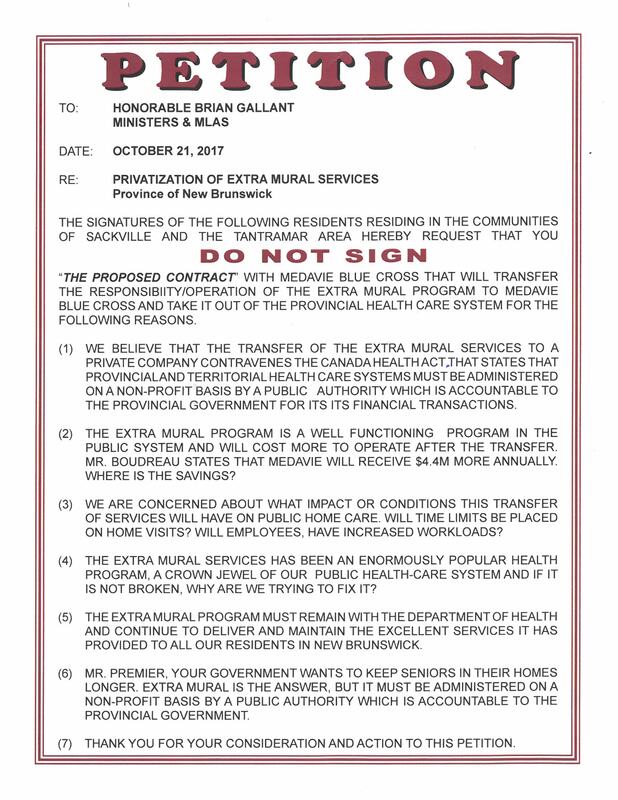 The petition, organized by former Sackville Mayor Pat Estabrooks, calls on the Liberal government not to sign a contract with the private company Medavie for the management of extramural home care services. It will also be sent or given to Health Minister Benoit Bourque, Minister for Seniors and Long-Term Care Lisa Harris and local MLA Bernard LeBlanc. 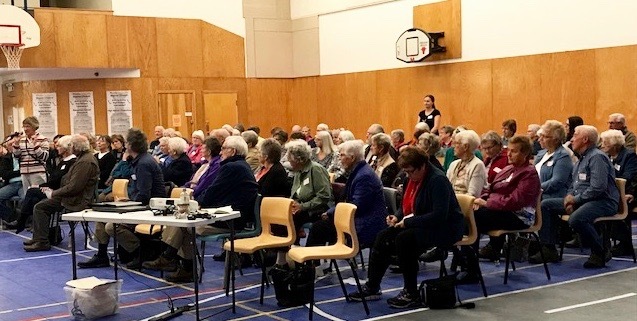 “My gut feeling is that our Ministers and MLAs have no idea how efficient this [extramural] service is or what services are offered to our seniors,” Estabrooks says in an e-mail to The New Wark Times. “To me, it is an excuse to contract out with no responsibility to government,” the former mayor adds. La Société de L’Acadie du N.B. (SANB) is also organizing a petition that can be signed until the end of November. The SANB petition objects that the government decided to contract out management of extramural and the tele-care 811 phone services to Medavie without soliciting tenders from other potential providers and apparently without commissioning a scientific study showing that privatization would deliver a higher quality of health care for patients. Click here to read the petition in both official languages and to see how many have signed so far. 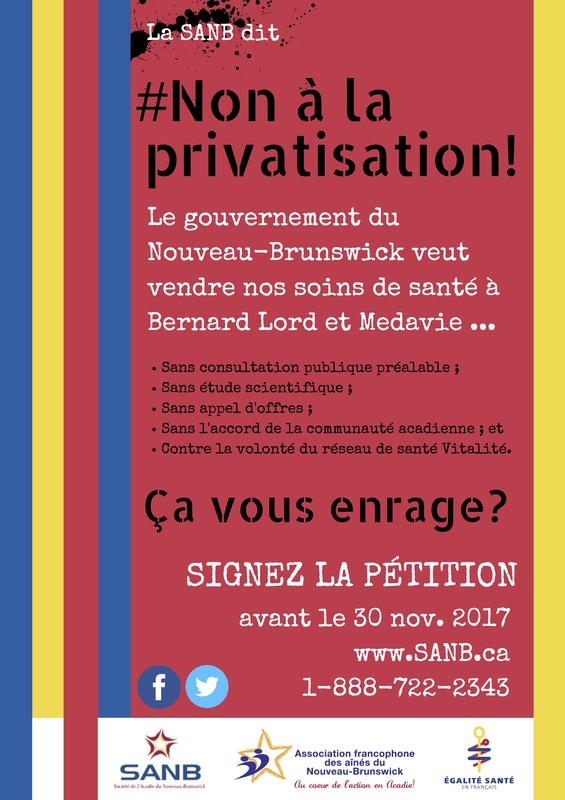 On Saturday, the SANB along with the New Brunswick Francophone Seniors’ Association and the group Égalité Santé en Français sponsored a full-page newspaper ad in the French-language daily newspaper L’Acadie Nouvelle accusing the New Brunswick government of acting without public consultation and in spite of strong opposition from Vitalité Health Network, the elected regional health authority. Hector Cormier, a long-time advocate for seniors, warns that the Liberals should be worried about losing support in the next provincial election. “Citizens in New Brunswick are up in arms against that ridiculous move on the part of government,” Cormier says in an e-mail sent to warktimes. The growing opposition to privatizing the management of home care comes as the Telegraph-Journal, New Brunswick’s largest newspaper, continues its series of reports on the apparent shortcomings of Ambulance New Brunswick (ANB), the paramedic service that Medavie has managed since 2007. In its latest article, published on Saturday, the newspaper reports that ANB is continuing to try to block requests for information about how often ambulances are out of operation because of paramedic shortages. The Telegraph-Journal first filed a request last March under New Brunswick’s Right to Information law, but has yet to receive the statistics it is seeking. Continuing reports about slow ambulances have been cited by those who argue that the management of extramural home care should not be contracted out to the same company that already operates Ambulance New Brunswick. This entry was posted in Health care, Home care, New Brunswick government and tagged Ambulance New Brunswick, Benoit Bourque, Bernard LeBlanc, extramural home care, investigative reporter Michael Robinson, Lisa Harris, Medavie, Pat Estabrooks, Telegraph Journal. Bookmark the permalink. I look at Extra Mural as an extension of Hospital care ! especially with trying how to figure out how they will handle the cannibus deal. If you’re unable to find the report on-line, please let me know and I will send you a copy. Already services to long term residences are dismally inadequate for some residents, these residences are under-serviced as it is due to government cutbacks and residences are enduring painful spasticity or rigidity.